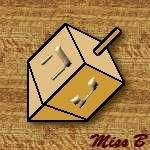 This tutorial was created and posted to this web site on December 4, 2000 and is © Miss B's Graphics from 2000 in perpetuity, all rights reserved, and is my own original design and not meant to copy or duplicate the efforts of any other PSP tut writer. Therefore, you may not download this tutorial and place it on any other web site, CD collection, or graphics group. If you wish to link to this tutorial from your graphics forum for use as a learning tool, I only ask that you first ask for permission via my Contact page (see Menu link above). For further information about the skill rating system used here, please read FlyByNightGraphic's informative Skill Standard rules. 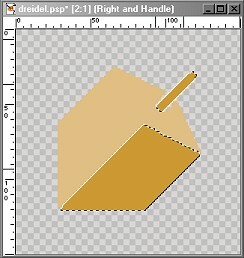 For the Chanukah Dreidel tutorial, you will need to download 5 files. 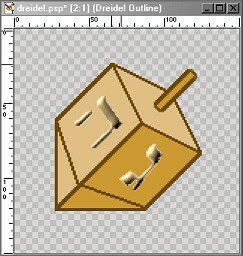 Four of them are the selections you will use to make the dreidel, and one is the wood grain image I used for the background. You can download them in this zip file. 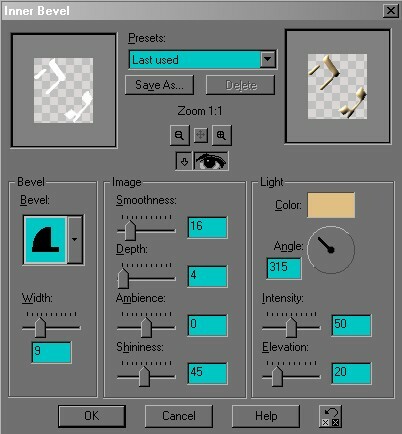 Each of the screenshots included with this tutorial have been enlarged somewhat for ease of viewing details. Your final image will be the same as the dreidel sample at the top of the page. Unzip the file and extract the four selection files to your PSP selections folder. If you don't already have one, just make a new folder named Selections within your PSP folder. Extract the wood.jpg file to the same folder you will be saving your dreidel image to make it easier to find when needed. Open a new graphic, 150 x 150 in size, with a transparent backkground, 72 ppi resolution and 16.7 million colors. Rename layer 1 as Background, and add a new raster layer (Layers > New Raster Layer). Now you can deselect (Ctrl+D), save your image again, and it should look like the one in screenshot 4 below. At this point we're going to add a drop shadow, but first we need to hide the background layer by clicking on the small *glasses* on the right side of the layer. Then make any of the other layers active (it doesn't matter which one) and merge all the visible layers (Layers > Merge > Merge Visible), and rename the merged layer Dreidel. Now I prefer to have each of my drop shadows on a separate layer, so I'm going to ask you to make your Background layer active, add a new layer and name it Drop Shadow (between the Background and Dreidel layers). You certainly don't have to make a separate layer if you prefer not to, but this is how I like to do it. 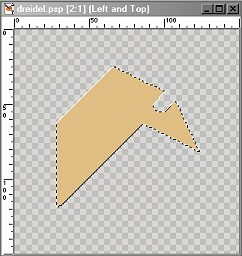 Now go back and make your Dreidel layer active, and with your selection tool, select a rectangle shape around your image and then click on your Dreidel to select it. Make your Drop Shadow layer active and choose Effects > 3D Effects > Drop Shadow and use the following settings: Vertical=3, Horizontal=4, Opacity=100, Blur=10 and the color is a dark brown. I used 452d03. Click OK to apply the drop shadow, and your image should look like screenshot 6. 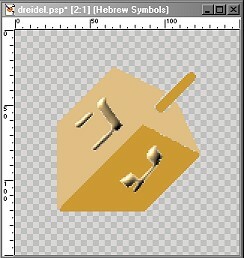 All that remains at this point is to choose what type of background you wish to have behind your dreidel. 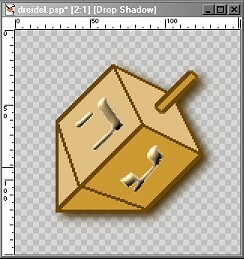 Since the dreidel is a toy top that a child spins on the floor, I flood filled the background with the light wood grain image included in the above zip file. To accomplish this, make your Background layer active and open the wood.jpg image. Then choose your flood fill tool, and change one of your color Style palettes to Pattern by clicking on the little triangle on the palette and choosing the one with the 9 little dots and rechecking to see that your Background layer is active, flood fill the background of your dreidel image with the wood grain pattern. Of course, you can add whatever type of background you wish if you don't want to use the wood grain image I supplied. Voilà . . . Your Chanukah Dreidel is finished. I hope you enjoyed this tutorial, and please do come back and visit, as I hope to have a tutorial on how to make an animated version of the Dreidel in the near future.